"Alright friends, let's stop all this ghoulishness and let's get grim. Hmmm? Now remember our rule: don't jump out of the window�unless it's open." 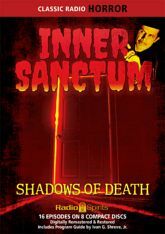 Your host creaks open the door and delivers you into the dark for sixteen terrifying tales of suspense and the supernatural. Amidst storms and curses, risks and obsessions, threats and things that go bump in the night, people are plotting death�or trying to prevent their own!